Ahmed Mohamed's school: It was afraid of Islam well before it thought a clock was a bomb. 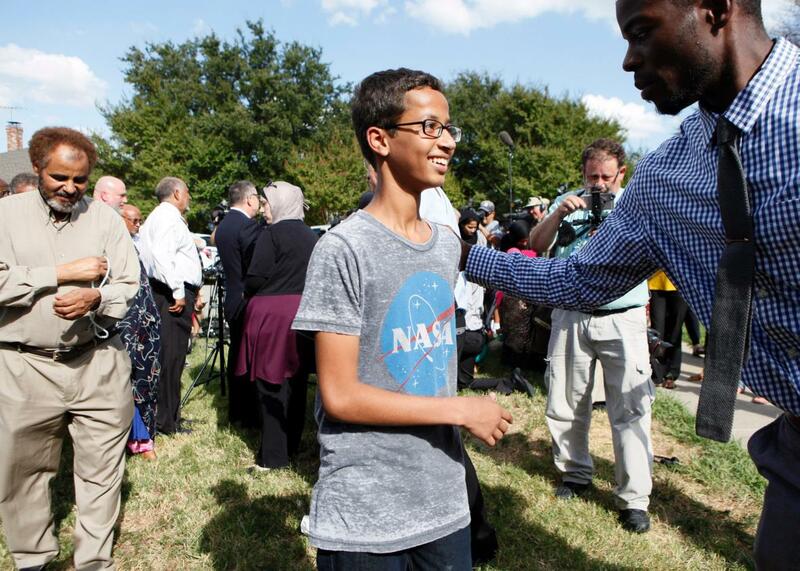 14-year-old Ahmed Mohamed is greeted by a supporter during a news conference on Sept. 16, 2015, in Irving, Texas. On Monday, Ahmed Mohamed, a 14-year-old who lives in Irving, Texas, was arrested after bringing a homemade clock to school. To teachers, administrators, and police, Ahmed looked like a potential bomb-maker. To the rest of the world, he looked like a confused kid wearing handcuffs and a NASA T-shirt. It would be reassuring to attribute the incident to the ignorance of one teacher spiraling out of control, an isolated incident bearing no greater import. Unfortunately, this wasn’t the Irving Independent School District’s first bout with Islamophobia. In 2012, the Irving School Board, which oversees just under 35,000 students in the Dallas suburb, got itself into a tizzy after a chain email was sent to board members warning, “Christians are going to have to stand up against the pro Islamic teaching in our public schools with CSCOPE curriculum” CSCOPE is a state-produced tool most teachers in Texas use to plan their lessons. Instead of hitting delete like most human beings who receive chain emails, the board hired someone to conduct a full report on the matter. Not just any someone, but a good “socially and fiscally conservative” former social studies teacher who “watches Glenn Beck on a regular basis,” said Jan Moberly, the director of the organization that administers CSCOPE. If anyone was going to snoop out that pro-Muslim rhetoric, it was going to be her. But did she find anything? No. After reading through every single textbook and producing a 72-page report—which the district paid her to write—the former teacher found in Irving’s textbooks a bias toward Christianity (which was mentioned twice as much as any other religion) and away from radical Islam. Whew. And why should she have found anything? After all, a 2010 resolution from the Texas State Board of Education already took care of unwanted Islamic influence in public-school textbooks. But Irving’s fight against Islamic creep didn’t end there. Earlier this year its city council voted to back a proposed law that rejected foreign influence on the courts. Why? Because they found out a local Islamic tribunal mediated civil cases on a voluntary basis for members of the local Muslim community. Something, I’ll point out, that Jewish and Christian organizations also do. Irving Mayor Beth Van Duyne has since become a conservative darling for backing the law even after the Muslim community called it out for what it was: fearmongering. It’s no surprise, then, that Van Duyne’s first Facebook post after Ahmed’s arrest thanked police for keeping children safe while also touting Irving ISD’s laudable STEM programs. She later edited the post to include the concern that, if this had been her child, she would have been pretty upset. Good for her for rethinking, but it shouldn’t have come to that. While it’s impossible to say for sure whether Ahmed would have been arrested if his last name weren’t “Mohamed,” I think we can all offer a pretty educated guess. The obvious absurdity that a school with award-winning STEM programs can’t tell the difference between a bomb and a clock is almost too upsetting to think about. As is the fact that police transported a 14-year-old boy in handcuffs to a juvenile detention center because he couldn’t provide an explanation for the clock other than that he wanted to impress his teachers with his obviously impressive skills. Schools are supposed to foster creativity. Teachers should be pushing students to their limits and praising academic behavior that goes above and beyond. Ahmed, who once built a Bluetooth speaker for a friend as a gift, has obvious talent. Instead of praising that potential, the school threw him in handcuffs and told him he was a danger to other students. And when they realized their mistake, they still suspended him for three days and sent an absurd letter to parents asking them to review the Student Code of Conduct with their children. That code of conduct prohibits students from bringing “a ‘look-alike’ weapon” with them to school—a provision Ahmed would have assumed he was following, because a clock doesn’t look like a bomb. The school’s administration has now made a fool of itself on a national scale. Serves them right.